A workshop on the Search for Extraterrestrial Intelligence (SETI), featuring leading scientific researchers as well as authors, historians, religious leaders, and biologists, will be webcast September 13-15. 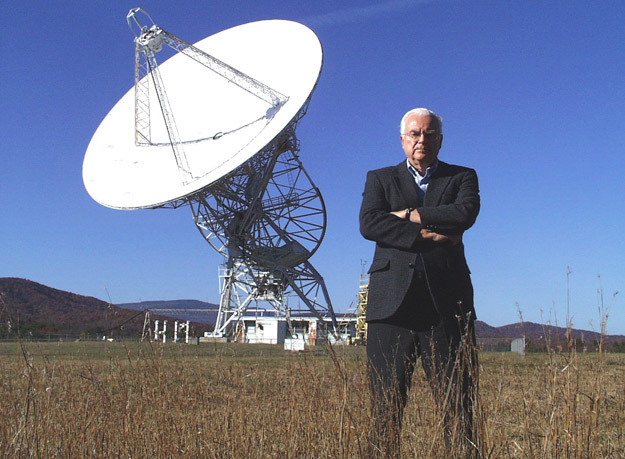 The workshop, held at the National Radio Astronomy Observatory (NRAO) in Green Bank, West Virginia, marks the 50th anniversary of Dr. Frank Drake's first search for radio signals from alien civilizations. Long before 1960, Drake had wondered if humankind was the only intelligent life in the Universe. "Fresh out of graduate school, I joined the staff in Green Bank, and thought I just might have the tools to find extraterrestrials," said Drake. He devised an observational plan and whimsically called it "Project Ozma," referring to a princess in the land of Oz. Drake selected two nearby Sun-like stars to observe. Dr. Frank Drake, now of the SETI Institute, first scientist to search for radio communication from extraterrestrials, standing in front of the telescope he used for those observations. The 85-ft diameter Tatel Telescope, located at NRAO in Green Bank, WV, was then one of the most powerful in the world. The Green Bank workshop presents a wide range of views on SETI, including those by Drake; Dava Sobel, author of the books "Galileo's Daughter" and "Longitude"; Vatican Observatory astronomer Dr. Brother Guy Consolmagno; Episcopal priest and evolutionary biologist Dr. Lucas Mix; and Poet Mary Turzillo. Drake will webcast his views on "SETI in 2061 and Beyond", at 8:30 a.m., EDT, on September 15. "This workshop focuses on a topic that has a profound influence on the way we view ourselves and our place in the Universe," said Dr. Glen Langston, NRAO astronomer and workshop organizer. "We are pleased to present this to the public through the webcast," he added.